Would you like a heart attack with that hot dog? As Liz and I were walking through the Mercado Central I told her how the concierge at my hotel said I couldn’t say I’d been to Santiago until I tried a terremoto, that elusive Chilean cocktail (I still haven’t had one). Then I asked her how she’d answer that question—If you’ve been to Santiago but you haven’t had a (blank), you haven’t been to Santiago. Okay, before I explain about completos and Dominó let me just say that the closest American comparison to both would be a Big Mac at McDonald’s, and I haven’t been inside a Mickey-D in over 20 years. Just not my thing (besides, I’ve always hated clowns and Ronald definitely creeps me out). But the completo is not a hamburger. It’s a Chilean hot dog. Sort of. Actually, it’s a bun of mayo and mushed avocado piled on top of a sliver of weiner. Remember I said that Chileans think mayo is a food group? This may be the best proof of that theory. But, you know, I have this philosophy about travel which boils down to, Wherever you go, you have to eat the goat. And since Liz says that I haven’t been to Santiago until I’ve had a completo, the goat today is a Chilean hot dog at Dominó. The hot dog doctors at Domino. Photos by David Lansing. There must be two hundred Dominós in Santiago. Okay, maybe it just seems that way because everywhere you go, there they are. They’re meticulously clean (which is true for most fast-food joints in Santiago). 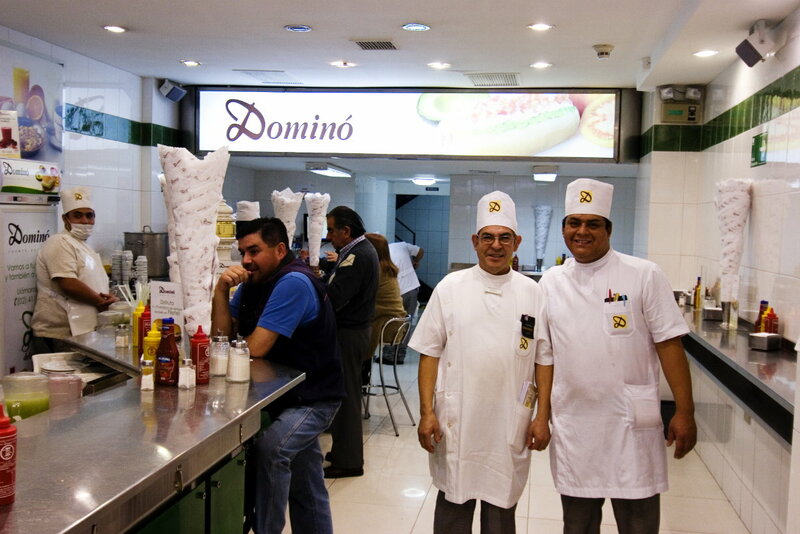 And just as all the servers at Fuente Alemana are women, at Dominó they’re all men. Dressed in long white gowns with deep pockets in the front so that they look more like medical assistants than waiters (I think they should put stethoscopes around their necks). 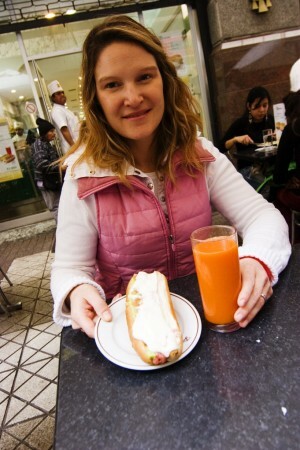 Liz with a completo (not healthy) and carrot juice (healthy!). Anyway, the other thing that kills me about Dominó is that they have these wonderful milk drinks with mango or chestnuts and fresh squeezed juices, the most popular being a blend of orange and carrot juice which is just so healthy tasting that your blemishes seem to clear up after drinking a glass. So of course, Liz orders a completo, which will double her cholesterol level the minute she puts it in her hand, and a fresh-squeezed glass of orange and carrot juice to somehow do a negative ion thing in her body to reverse the 640 calories she’s about to eat so that somehow she’ll actually lose 5 pounds from eating the weiner. Or at least that’s what we tell ourselves. I take a bite of my completo. I’m sure there’s a hot dog in there somewhere, but I can’t see it and I don’t taste it. All I taste is a big mouthful of slippery avocado and sweet mayo. One bite and I’m done. (When I said you have to eat the goat I didn’t say you had to eat the whole goat.) But, hey, that orange/carrot juice is great. So great that I decide to get another (plus the roof of my mouth still feels coated in mayo fat). And while I am gone, a homeless lady steals my completo. The perfect ending as far as I’m concerned. I’m a doctor. I think the picture of Liz above says it all. Now don’t get me wrong. I’m not saying don’t eat it. I’m just saying share it, or make it a picnic meal for 3 or 4. Along with the carrot juice, of course. It’s interesting how all cultures seem to have their unhealthy junk food. It’s like Hawaiians and Spam, that yucky canned meat that is made from God only know’s what and is salted to death. They put it on and in everything… and Heaven help you if you say anything subversive about it, lol. If you say anything bad about it, they look at you like you have two heads. To each his own, but hot dogs and carrot juice is not my dream combo. una sola vez. Los hot-dogs del Dominó tenemos que traerlos del centro cuando tenemos cosas que hacer en ese lugar o Tobalaba o Apoquindo. No es gracia disfutarlos fríos. Además es bueno tener la alternativa del hot-dog y liberarnos de hacer almuerzo o omida. Vivo en Nocedal comuna de La Reina A pasos de Salvador Izquierdo….y a continuación de Príncipe de Gales. Tenemos 10 Bancos alrededor un Unimarc..Oficinas Dentales…..de Propiedades…..etc….etc….Agradeceríamos mucho tener los ricos hot-dogs a pasos. Sabemos que les iría tan bien como en todos los locales.Esperamos vuestra visita. What’s with the bitching about completos? If you didn’t know what type of completo you were ordring you are an idiot. You probably ordered the one that has it all. You only got what you asked for.